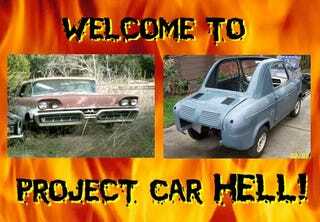 Project Car Hell, 1958 Edition: Mercury Commuter or Vespa 400? Yesterday's all-Corvette Choose Your Eternity poll resulted in the '68 just barely edging out the '69, no doubt due to the Jimi Hendrix connection. Now it's time to try a different type of theme; we haven't yet seen a selection of cars based on a model year alone, so today we're going with two vastly different- yet vastly cool- choices from Anno Domini 1958, the year Nikita Krushchev became premier of the Soviet Union. Inspired by the DOTS Mercury Commuter that blew away the competition in the Best DOTS Wagon Poll, I figured we needed a Hell Project Commuter as soon as possible. And, really, it's the perfect mix of must-have coolness (four-door hardtop wagon with every conceivable example of Chromium Rococo Excess) and impossible-to-find parts (MEL engine, weird not-shared-with-any-Fords trim and interior components, wraparound glass). But they're just about impossible to find, and expensive as hell... unless, of course, you head to Texas and score this diamond-in-the-incredibly-rough '58 (go here if the ad disappears) for a very reasonable $1,250. The 410 engine is "stuck," but you can actually find the MELs if you dig hard enough (anyway, we'd want to put a quad-turbocharged Cammer 427 in this thing). The seller is kind enough to inform us: "Missing: radiator, radio, front seat, front wheels," which makes one think that maybe everything else is still there! Could be, could be! Dropping anchor in a 5,000-pound monster station wagon is fun and all, but it can get tiresome. Don't despair, though- you can still have a machine that glows with 50s optimism yet can maneuver through tight traffic and park in the stingiest imaginable urban parking spots. For example, this 1958 Vespa 400! The seller doesn't pull any punches, with the seemingly self-contradicting "restorable basket case" description right in the main subtitle. What you get here is a "restorable chassis" and seven crates of parts. Seven crates of parts! If ever there was a Project Car Hell mantra, that's got to be it! What's in those crates? How big are they? To add to the fun, the car has never been registered in the United States, but this is the sort of situation where the very flexible and understanding folks at the DMV will stop at nothing to help you sort out the paperwork... right? Yes, of course! Now, you could take the chassis and the Seven Magical Crates and do a period-correct restoration, which would certainly be fun... but we're thinking more in terms of something like this Vespa project. Either way, if you could finish this thing you'd be certain to love your Vespa. Thanks (and the ever-elusive second half-credit towards a Project Car Hell Tipster T-shirt) to BananaDoc for the tip; BananaDoc, as you may recall, sent in the Rolls we saw in the England's Dreaming PCH back in December.